but not their relative distance from the sun. 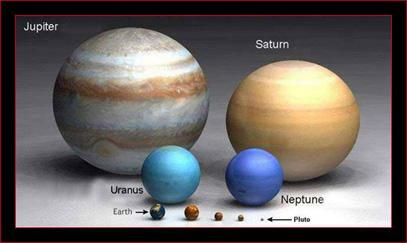 This image shows the relative distances, but not the relative size of the planets. The Solar System has 8 planets. Not the 9 planets you grew up with. That's because the International Astronomical Union reclassified Pluto as a dwarf planet in 2006. To qualify as a planet, an object needs to orbit the Sun, have enough mass to pull itself into a spherical shape, and have cleared out its orbit of other material. It's this third requirement that Pluto hasn't fulfilled; it's just a fraction of the mass in its orbit, while the other planets are millions of times more massive than everything else in their orbits. 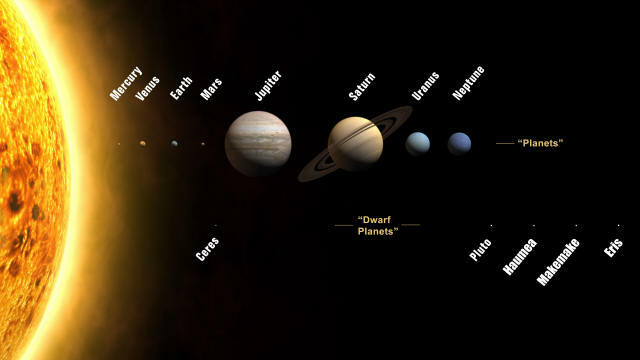 There are now 5 dwarf planets in the Solar System: Ceres, Pluto, Eris, Haumea and Makemake. Dwarf planets are objects that orbit the Sun and have enough mass to form a sphere, but they share their orbit with other objects. And as telescopes improve, more dwarf planets will be discovered. There might eventually be more dwarf planets than planets. The theoretical size of the Solar System goes out as far as the the Sun's gravity overpowers anything else in the region; and this is almost 2 light-years away, nearly halfway to the nearest star. It's thought that the Oort Cloud – a region where the long-period comets come from – extends out to 100,000 astronomical units from the Sun (1 astronomical unit, or AU, is the mean distance from the Earth to the Sun). Most of the mass of the Solar System is the Sun. In fact, the Sun contains 99.86% of the mass in the Solar System. It is 73% hydrogen, so most of the matter in the Solar System is hydrogen, with the remaining amount being mostly helium, oxygen and carbon. Everything else, like the metals and rocks is just a tiny fraction of a fraction of the mass in the Solar System. Since the Earth is constantly resurfacing itself, we can't find out how old it is, but there's another way to find out. Meteorites, which date back to the formation of the Solar System, have been raining down on Earth for billions of years. Scientists have sampled meteorites and learned most are 4.6 billion-years-old. That means that everything in the Solar System formed around the same time – give or take a few million years. 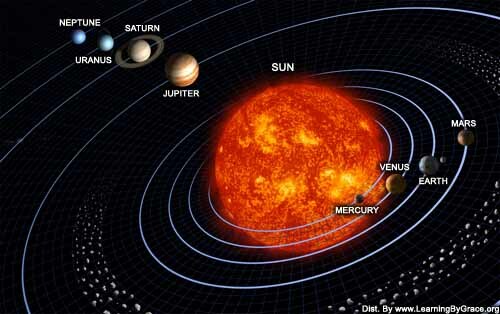 All the objects in the Solar System orbit the Sun in a counter-clockwise direction. This matches the theory that the Solar System formed all at once from a cool cloud of hydrogen. As the gas came together, it began to spin, so that the Sun collected in the middle, surrounded by an accretion disk of gas and dust. All the planets and other material in the Solar System formed within this rotating disk. There are a few exceptions, however, like Halley's Comet. Spacecraft from Earth have visited or orbited every planet in the Solar System, and more are on their way to visit some of the dwarf planets. We've explored the Sun, the Moon, and many asteroids. And now some of the oldest spacecraft still active – NASA's Voyager spacecraft – have almost reached the Sun's heliosphere; the point where the solar wind slows down as it bumps against the interstellar wind. 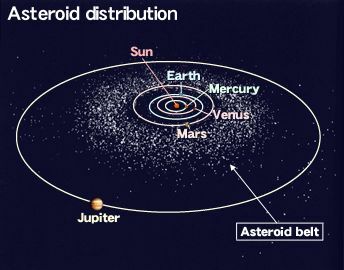 Numerous irregularly shaped chunks of rock called asteroids or minor planets orbit the sun roughly between the orbits of Mars and Jupiter. Gravitational perturbations keep these objects from forming a planet due to their orbital energy, instead colliding and breaking apart into dust and smaller bodies. The planets inside the Astroid belt are known as the inner planets, while those beyond are known as the outer planets. There are over 7000 documented asteroids and hundreds more are discovered each year. The total mass of all the asteroids is less than that of the Moon. Many are too small to be detected while others are up to 200 km in diameter. The Peekskill , N.Y. meteorite of 1992 weighed 12.4 kg. Ponder for a moment that millions of pieces of space debris, ranging in size from a grain of sand to several meters, bombard our Earth's atmosphere every day. A meteor, often known as a "shooting star" or "falling star," is a visible streak of light in our atmosphere. They are caused by meteoroids entering our atmosphere and vaporizing due to ram pressure, not friction, leaving a visible trail of light. Most of the millions of meteoroids that enter the atmosphere are burned up in our mesosphere (about 30 - 50 miles up) and never reach the ground, but some do. Rarely, as in the Great Daylight Fireball of 1972, a meteoroid will travel through our atmosphere and pass out again. These are known as Earth-grazing fireballs. Meteorites are meteoroids that reach the Earth's surface. On rare occasions they can cause severe or even catastrophic damage such as the remote Russian Tunguska event of 1908 where a large section of forest was flattened. 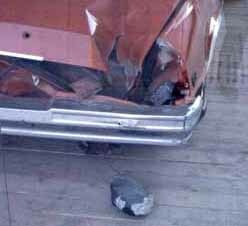 The cause was theorized to be an air burst from a meteoroid or comet. Meteor showers are named after the constellation from which they seem to radiate. The showers, or even rarely storms, are caused when our orbit intersects with a field of cosmic debris. 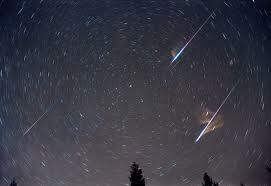 On such occasions, numerous meteors enter our atmosphere every minute – their trails lasting only about a second. Comet Hale-Bopp, or The Great Comet of 1997. Photo by Herman Heyn. Comets are icy solar system bodies that originate beyond the orbit of Neptune. Short term comets originate from the Kuiper Belt beyond the orbit of Neptune, while long term comets originate from the Oort Cloud in the outer reaches of our Solar System. A comet’s nucleus is a mixture of ice, dust and rocky particles ranging in size from tens of meters to tens of kilometers across. When a comet gets close enough to the Sun, it interacts with solar radiation and the solar wind to form a visible coma, or thin atmosphere, and often a tail that always points away from the Sun due to the solar wind. The Kuiper Belt (rymes with viper) is a system of thousands of rocky and icy objects orbiting the Sun from beyond Neptune's orbit extending roughly from 30 to 50 AU from the Sun. One astronomical unit, or AU, is the mean distance of Earth from the Sun. It is now considered to be the source of the short-period comets. Occasionally the orbit of a Kuiper Belt object will be disturbed by the interactions of the giant planets in such a way as to cause the object to cross the orbit of Neptune. It will then very likely have a close encounter with Neptune sending it out of the solar system or into an orbit crossing those of the other giant planets or even into the inner solar system. In 1950, Dutch astronomer Jan Oort proposed that certain comets come from a vast, extremely distant, spherical shell of icy bodies surrounding the Solar System. This giant swarm of objects is now named the Oort Cloud, occupying space at a distance between 5,000 and 100,000 astronomical units. (One astronomical unit, or AU, is the mean distance of Earth from the Sun: about 150 million kilometers or 93 million miles.) The outer extent of the Oort Cloud is considered to be the "edge" of our solar system, where the Sun's physical and gravitational influence ends. The Oort Cloud probably contains 0.1 to 2 trillion icy bodies in solar orbit. Occasionally, giant molecular clouds, stars passing nearby, or tidal interactions with the Milky Way's disc disturb the orbit of one of these bodies in the outer region of the Oort Cloud, causing the object to streak into the inner solar system as a so-called long-period comet. These comets have very large, eccentric orbits and have been observed in the inner solar system only once.